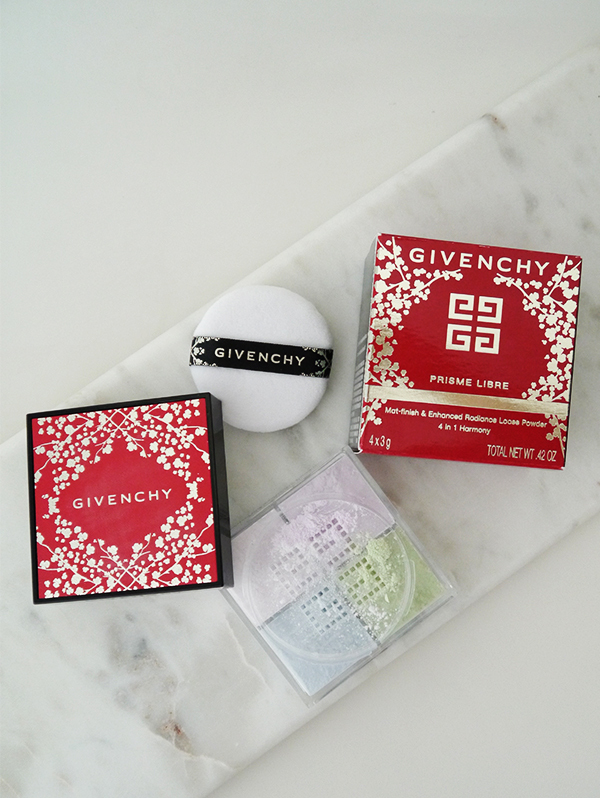 Limited edition releases of Givenchy Le Rouge lipstick and Prisme Libre loose powder are nothing new for the brand. In fact, last year I reviewed different versions of both products that featured a motif of white crosses against a black background, inspired by a pattern from their couture shows. 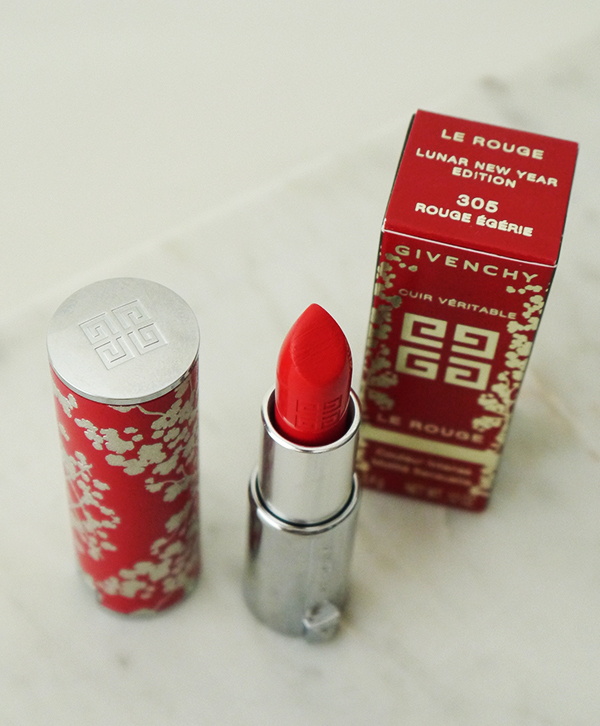 This time around, the Lunar New Year limited editions take their cues from auspicious Chinese symbolism. Think red (a colour traditionally associated with good fortune) and gold (a symbol of wealth) and cherry blossoms (a symbol of spring and renewal, as the Lunar New Year is also called the "spring festival" in Chinese). 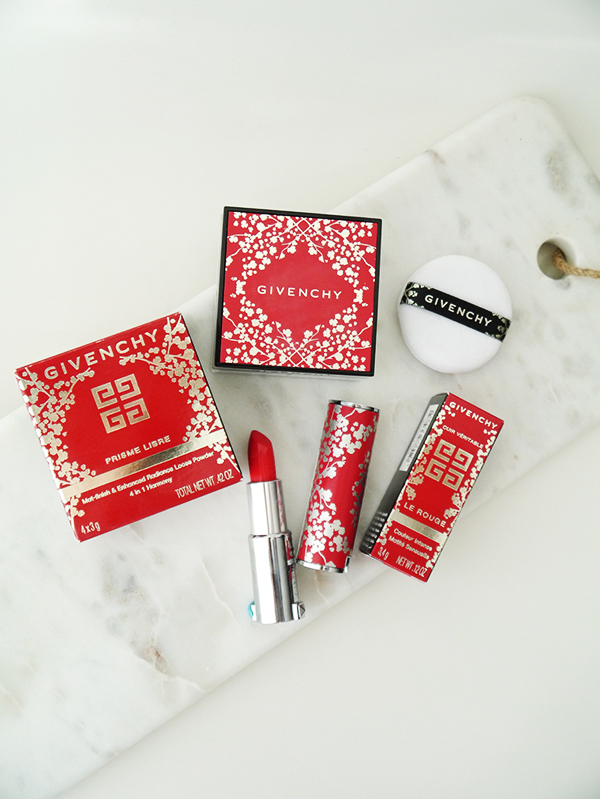 Red backgrounds and gold cherry blossoms adorn the outer boxes and the leather-clad packaging of both of Givenchy's Lunar New Year Edition offerings. 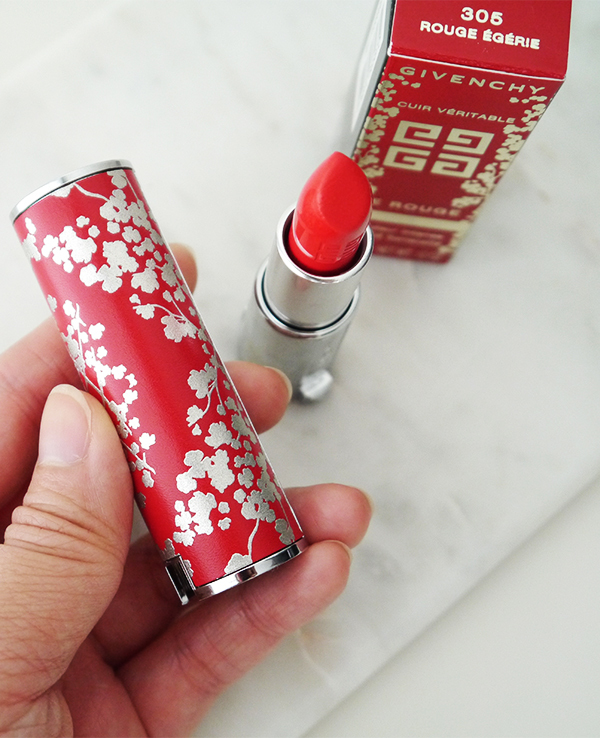 Just look at how stunning Givenchy Lunar New Year Edition Le Rouge Lipstick ($45) is! 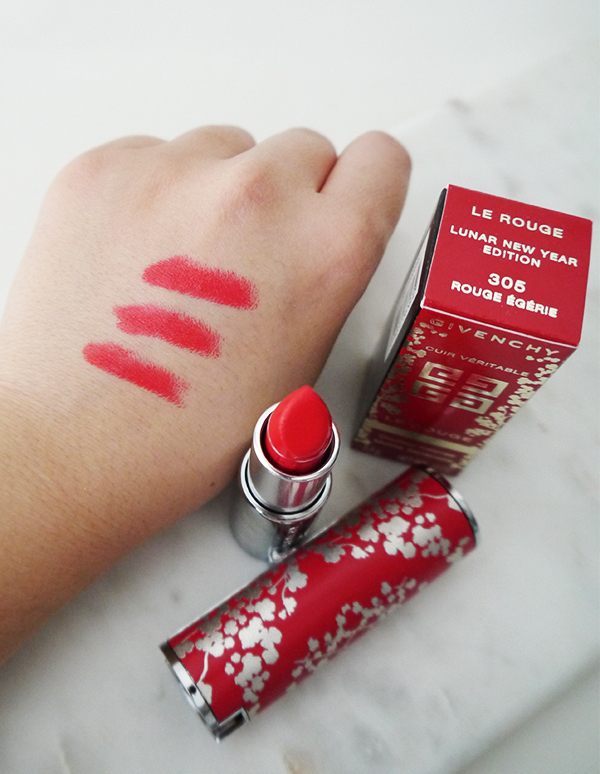 All the luxe signatures of Le Rouge lipstick are here: the case decorated with genuine leather; the monograms; the little stud decorating the base of the lipstick on both sides; the precisely cut bullet that lets you apply colour straight from the tube; the creamy, highly pigmented matte formula that glides on and wears as effortlessly as any lip balm. 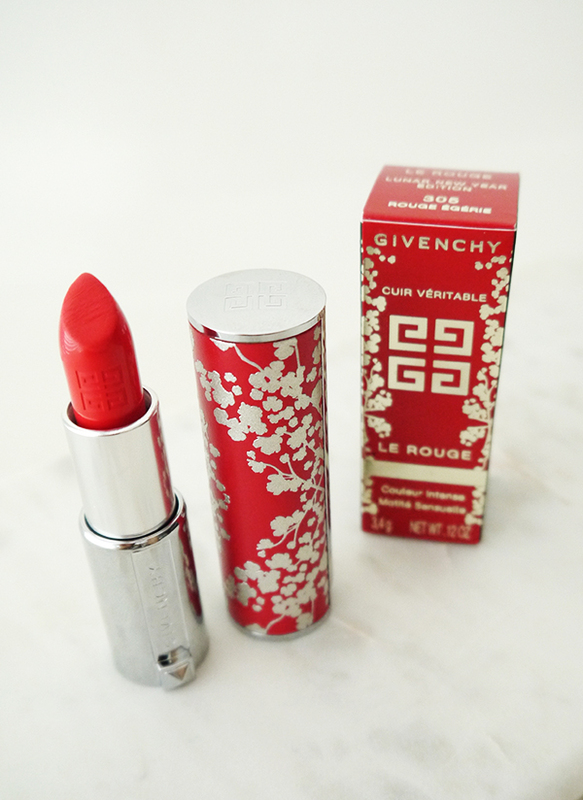 My mom hasn't seen this lipstick yet but I can already picture her exclaiming over how beautiful it is. The Madewell top I'm wearing is black with gold stars, so this lipstick will be the only red thing I'm carrying and wearing that night. The shade is a coral red that's reminiscent of the bright cheerful red on lucky envelopes. I think of it as a "spring forward" red—the shade isn't as dramatic and wintry as cherry red or really deep crimsons and burgundies. It's lighter, with enough pink and orange undertones to suit warmer days ahead. One swipe delivers a lot of pigment. Like many of the best luxe matte lipsticks, it's not a true flat matte—there's enough creaminess for the shade to gain flattering depth and dimension when light hits it. 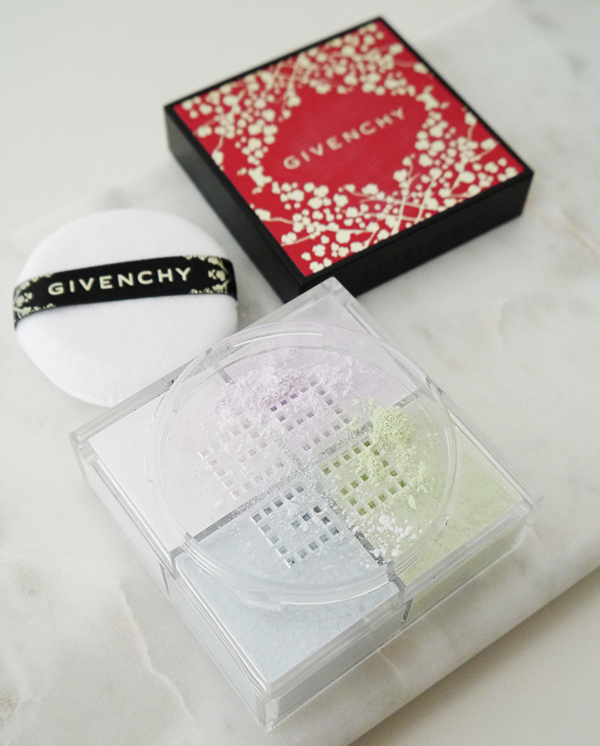 Aside from looking nice on a vanity, Givenchy Lunar New Edition Prisme Libre Powder ($69) is a versatile product to have in your arsenal. The four pastel shades—pink, purple, green, blue—help colour-correct and enhance radiance, while the powder itself offers a velvety matte finish. You can use it over just concealer and BB cream or a sheer foundation to achieve a more flawless finish, or over full-coverage foundations as a finishing and setting powder. The instructions say to keep the puff in place while shaking the container upside down, but I find that doesn't dispense product through the monogram Gs very well. Instead I take the puff out and screw on the lid, flip it upside-down, and tap the bottom of container once with my index finger. Then I flip it right-side up and tap the lid to get rid of any excess powder that'll fly out when I unscrew the lid. The result is what you see in the photo below: Just enough product to swirl a powder brush into lightly and buff into skin. To my readers, Happy Year of the Dog! May it bring you joy and good fortune!